Should this item be out of stock at the time of your order, we would expect to be able to supply it to you within 2 - 5 business days. Featuring unreleased out-takes and demos, this new edition of 'Sugar Mouth' has been completely re-mastered. This outstanding, unpretentious pop album was originally released in 1994. As far as back story goes, well, you could say David Kilgour is something of a cult figure, as the guitar and voice of left-field trio The Clean and a slew of fantastic solo albums - he's up to 9 now - he has written the blueprint for New Zealand indie music and many bands to come. Indeed, Kilgour's talent for writing furiously catchy pop music with an understated Kiwi-style aura of '60s psychedelia is well-documented. A musician with a timeless way with guitar and song, just like his terrific debut, Here Come The Cars (1992), Sugar Mouth is also laden with mesmerizing melodies and shimmering pop brilliance. However, like all his work there is the dash of sunny melancholy, at times swapping out the guitar fuzz for a touch of acoustic strong's and piano. And, like all his work, it's ear-catching from the start with No No No, Fallaway and Filter perfect examples of Kilgour's knack for well-crafted but deceptively simple songs. Before the album rollicks on through to the quietly graceful closer - Never End. 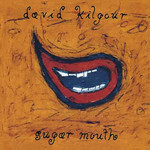 David Kilgour's Sugar Mouth is a stunning record, both glistening and honest, and is yet another reason he can make claim to being one of New Zealand's best musical treasures.